I have to say, this first "real" arc of this second Index series is actually somewhat impressive, consider how low of an opinion I had after watching the second half of the original series. The reason, I think it's the fact they've returned to the root that made the series so popular at first place--action oriented plot as building blocks for a grander arcs. The first series start to lose momentum half way because they had fall to making small arcs that doesn't really contribute to a grand plot. 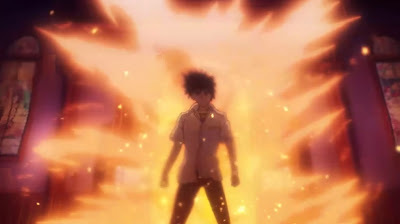 In fact, I believe two of their arcs from the first series are inserted into the first series mostly serve as a lead-in for their Railgun series. So the returning to making the building block for a grander plot in the first arc of the new series couldn't make me any happier. Having said that, however, the preview at the end of episode 5 suggests that the next arc is going back to the silly crossover with Railgun again. Well, I hope that doesn't last too long, 'cause to me, that is one sure way to kill my interest for this series.